Reaching the six-month mark is a key milestone in baby’s first year. Not only is it their ‘half a year birthday’, but it’s also the WHO recommended weaning age and the age at which some babies will start to crawl. It’s essential that your home has been baby-proofed to protect your inquisitive and increasingly mobile 6 month old baby! If your baby isn’t crawling just yet, remember that all babies are unique and meet milestones at their own pace. Developmental guidelines simply show what your baby has the potential to accomplish – if not right now, then soon. If you do have any questions about your baby’s development, ask your doctor. Let’s look at the possible 6 month baby development milestones, split across the key areas of physical, motor, mental, sensory and social & emotional. A six month old baby should have doubled their birth weight, although growth will slow slightly in the second half of their first year, creating a curve on their personal growth chart. You can expect the average baby to gain around 450-560g and grow about 1-2cm during month six. Some babies will have cut their first teeth by six months old, so you might want to buy some baby teething toys for baby to chew on – like a safe, firm, rubber teething ring. These can help ease the pressure and pain in their gums. Make sure you choose safe, non-toxic teething toys that can be sterilized to kill any lurking germs. You’ll also need to clean baby’s teeth twice a day. The UK National Health Service (NHS) recommends using a tiny smear of fluoride toothpaste on a baby toothbrush. As your baby’s core strength continues to develop, they should be able to sit unaided for longer periods. You might see your baby using his arms for support. This increased physical strength also means that most babies will be able to roll in both directions, while some will even be lunging forward using their legs and crawling. Making sure that baby has lots of safe things around him to touch, mouth and manipulate will help with his development, but it’s important to keep a close eye on your baby while he’s practising all these brand new skills. By six months, a baby’s fine motor skills should have developed to the point that they can pick up and let go of an object, and move it from hand to hand. He’ll understand that he needs to use his hands to pick something up, and might even grab for an object as it drops – although don’t expect him to be able to catch it just yet! If you’ve decided to try baby-led weaning – where your baby feeds himself with finger foods – don’t expect him to have a good pincer grip at six months old. He’ll use his fist to grab and hold instead. A 6 month baby food chart will suggest soft starter foods such as iron fortified baby cereals (baby rice) and steamed vegetables like carrots, green beans, sweet potatoes, potatoes and zucchini. Batons of soft fruits like banana, pear and steamed apple are also good choices for 6 month baby food. Do keep a close eye on your baby’s reactions to any new foods, and be vigilant against potential allergies. If you have any concerns about specific allergies, consult your doctor before feeding these foods to your baby. Playing becomes a serious business for baby during month six, as their memory skills continue to improve. They should now be able to link actions with reactions, enjoying noisy toys that they can shake or bang. Your baby is also learning that his actions can get a reaction from you, so you might find his efforts to get your attention increasing. Books should also hold increasing interest for your baby, and soft washable books are ideal at this stage when everything will go straight to baby’s mouth! Your baby will also love to listen to you read or sing – and might even babble along with you. Books about animals can offer the opportunity to delight your baby by making funny animal noises that they might try to copy! Your baby is becoming increasingly aware of the world through their senses, and most six month old babies will turn towards sounds and voices. They’ll also imitate the sounds that they hear, with some babies able to combine syllables or ‘jabber’. 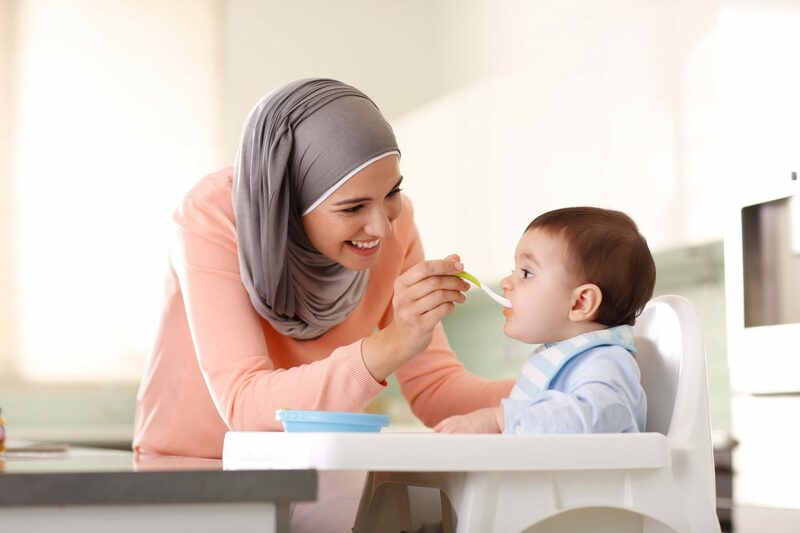 Moreover, weaning offers the perfect opportunity to introduce your baby to different tastes and textures, and the UK National Health Service guidelines recommend letting your baby enjoy touching, holding and tasting their food for a multi-sensory feeding experience. As your baby gets older, he’s becoming more expressive. By six months old a baby will be displaying his emotions in a variety of ways, including complaining or crying when unhappy, and giggling, cooing or squealing with joy when happy or excited. Unfortunately, separation anxiety is another emotion that a six month old baby may have to deal with. This can be especially difficult for those using childcare while they work, as a baby that was previously happy to be left with anyone can suddenly become very distressed when separated from you. Don’t be tempted to sneak away when he is distracted. Always say goodbye and your baby will learn to trust that you’re going to come back.